A missing cat named Taboo is back with his petmom again after two years, thanks to several people who pitched in to help him find his way home. A missing Liverpool, UK area cat named Taboo is back with his petmom again after two years, thanks to several people who pitched in to help him find his way home. 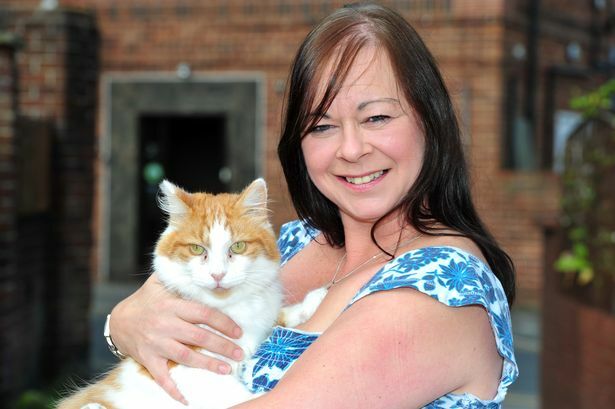 When Taboo went missing from his Heswall, Wirral home in October 2012, his petmom Linda Davison put letters through doors, asked people around town and contacted the RSPCA in an effort to find him, all with no luck. 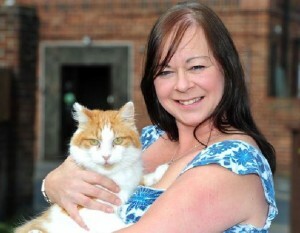 A year later she moved to another home in Heswall, which meant Taboo wouldn’t find her if he did return to his old home. Taboo’s homecoming was set in motion early last week when a concerned passerby contacted the RSPCA after seeing a cat that seemed lame, and Wirral RSPCA animal welfare officer John Littlewood came out to check on the animal. The cat only had a minor leg injury, but the officer did a microchip scan to see if his owner could be traced. The cat was chipped, and was registered to an L. Davison, but the contact information and address were out of date. Cat found 1/9 ginger long haired cat. Microchipped to a L Davison who reported the cat missing in the heswall area on 10th november 2012. Mobile number no longer in use and both addresses registered on the chip have not produced the owner. L davison is possibly still in the heswall area. Cat is called Taboo and is currently at a vets with an injured leg after being collected by the rspca. Any information contact wirral rspca on 0151 6386318. Gusto restaurant and bar in Hewsall played a key role in getting Taboo back home when they shared John’s appeal looking for L Devidson at their Facebook page. A friend of Linda’s saw the post and tagged her, and that led to the happy reunion. Linda told the Liverpool ECHO: “When I got the call that he’d been found I burst into tears. I couldn’t wait to see him and can’t stop smiling. “When I collected him he came straight over to me and I was back in tears. I couldn’t wait to give him a cuddle, he was just following me around and now he won’t leave me alone. “I never gave up hope, I thought maybe someone had taken him in or was feeding him. “The funny thing is, John [ RSPCA officer John Littlewood] told me the person who called them about Taboo had seen him near the Devon Doorway about a year ago, so it looks like he’s been staying around Heswall but was never able to find me. “He’s such a friendly cat ­– maybe too friendly for his own good. He’s in really good condition so hopefully someone’s been looking after him. John Littlewood said: “I’ve had a case where a pet was found nine months after going missing, but two years is a personal best. 2 Cats, 1 Cat Tree!